To import multiples contacts using a file click on “Address Book” in the main menu. Select "Import Contact" from the drop down menu. Choose the file of contact you want to upload from your computer. The file can be of type comma-separated values(.csv), excel 2003(.xls), excel 2007 (.xlsx) and above, text file(.txt - with comma separated columns of data). For any file type, make sure that all the data are sorted neatly in columns. i.e all mobile numbers are in one column, all first names are in another and so on. The sequence of columns does not matter. You can upload data into all columns listed below: Mobile Number (required), Title, First Name, Last Name, Email, Mobile Number 2, Gender, Date/Date of Birth, Area, City, Country, Optional One, Optional Two. Click the ‘Upload’ button when done. Once the file is uploaded you will be shown a preview of the data. Now map your data by selecting the field from the drop down that matches the data in that column. Repeat for each column. Select the group (s) that you want to add the contacts into. The 'Default' group will always be selected. 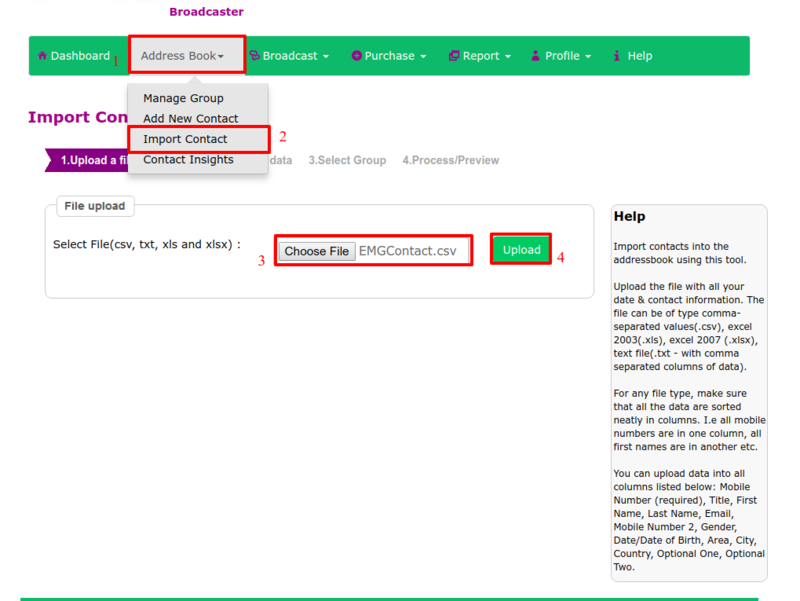 It is your master group where all contacts are added. Click 'Next' to proceed. This is the last step to confirm and verify your import. 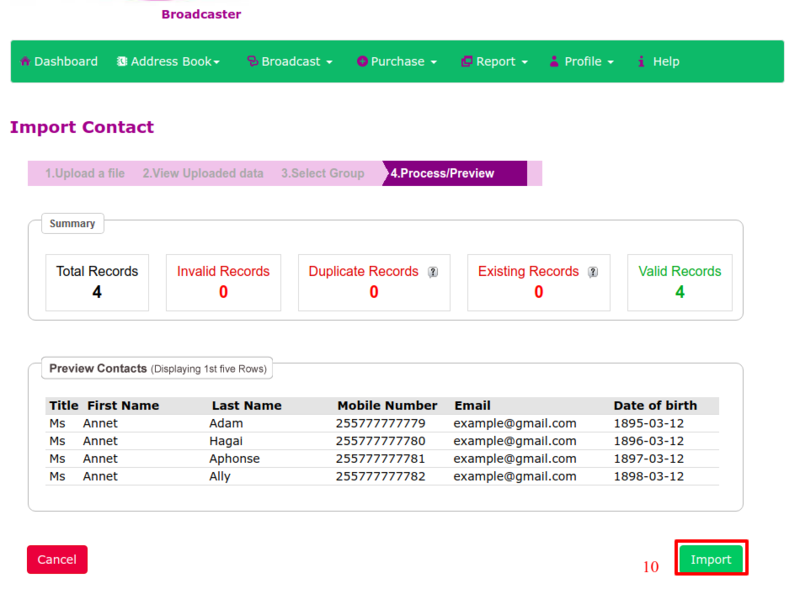 You can download the invalid and duplicate records (same mobile number) by clicking the number in each box. 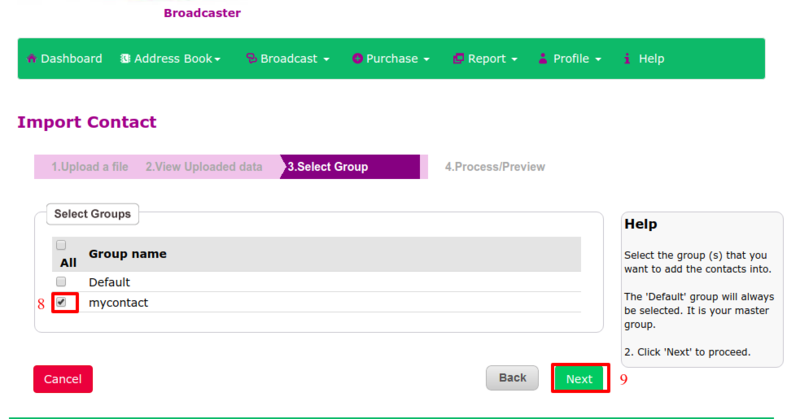 If satisfied, click “Import” to complete the process of importing contacts. Then you will get a notification "Data inserted successfully"